55 MPH Velcro - Velcro so strong it will hold up in 55mph winds, or 55mph worth of pressure tugging on it when you dive or slide. It all makes sense now. We wanted to make sure the harness stays were it is supposed to be, during the whole game. Compression Formed Velcro Lock - This is the last stage of the velcro system. This goes on top, because its on the top we wanted it to look cool. So we added a logo and some neat compression. Quick Release Handles - Compression formed pod straps are lighter. They have also been set to the perfect length, eliminating excess material. Cupped Neoprene Ejector Loops - This is the area that stretches around the actual pods. Instead of depending on elastic straps to keep your pods in place, we have developed a specific pattern of compression neoprene that actually wraps around the pod itself, and causes a downward tension. This design keeps the pods securely in place, while being able to forcefully eject the pods from the loops whenever youre ready to pull that quick release. Direct inject is also featured to make it look good. As we discussed before, style is key. Stay Open Pod Loops - Weve introduced a plastic frame at the base of each pod loop. The new frame forces the loop to keep its open shape at all times, providing optimal ejection capabilities. The insert frame keeps the pods centered, while loading the harness and while ejecting pods. A centered pod ejects smoother. Its all part of the development process to bring you the best performance possible. Venting - In an effort to use the most reliable materials at the lightest weight, we incorporated a vented foam back pad. Every other material has been chosen based off its lightweight and breathable characteristics. Memory Elastic - The memory elastic offers the most comfortable fit available. It also retains its original shape longer. Thats why its called memory elastic. Secondary Pod Wraps - With todays games having multiple formats, you need a versatile harness. The New Assault Harness has been designed to be used in NXL style games as well as larger format games. To accommodate for this we have included secondary pod wraps between each pod loop, and on the outsides of the pod loops. This allows you to carry 3 pods up to 9 pods. Neoprene Comfort Belt - The first belt that goes across your waist carries the most pressure. Some of you may notice this when you get that annoying harness rub. Well it annoyed us too. Thats why we added a neoprene padded belt. 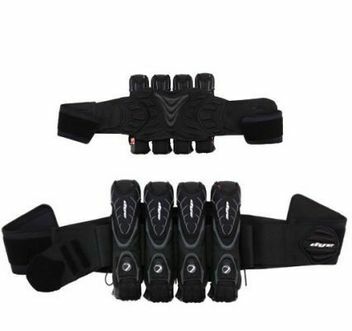 This is the first move into a more comfortable lightweight harness system. The more comfortable you are while playing, the more you can focus on the game. Center Stretch - The center point of assembly for the harness is directly over the spine. So when the belts are stretched around to fit, they are actually pulling from the center of your back. This assembly style ensures that you are getting the most comfortable and efficient use out of the harness system. Other harnesses tend to pull from the sides, not offering a true wrap around harness. Its not so much something you see, but something you feel. And to us, that little difference could aid in making a game winning move. Question about "Dye Assault Battle Pack 4+5"